Once upon a time, back in the heady, innocent days of 2014, I reviewed a book called The Mincing Mockingbird Guide to Troubled Birds. Of all the books I’ve ever had the honor of reviewing for this site, it was in some ways the most attuned to my own particular sensibility. 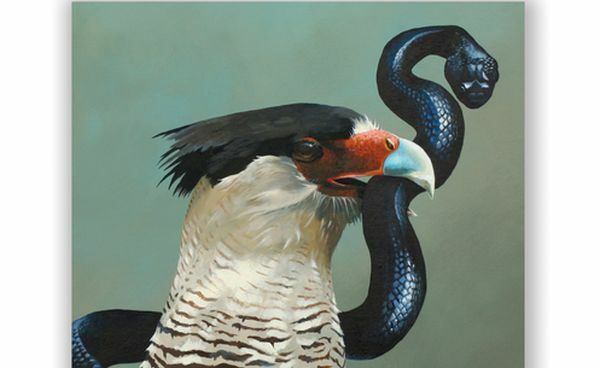 The combination of dark humor, sly intelligence, and very very pretty paintings of birds was, unsurprisingly, a winner in my eyes. I’m pleased to report that if you agreed with me on that one, you’re very likely to enjoy Prolonging Revenge Through Reincarnation as well. 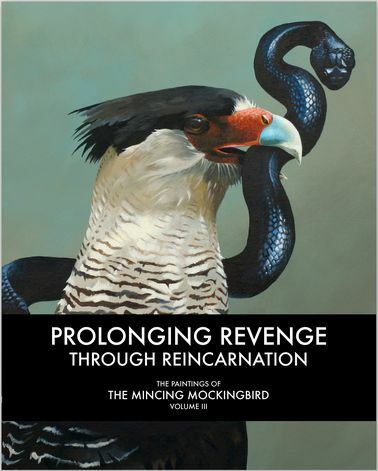 In some ways, Prolonging Revenge Through Reincarnation is a very different book than the Guide to Troubled Birds. A hefty and lavish hardcover, it presents more than a hundred avian portraits by Matt Adrian, A.K.A. The Mincing Mockingbird. Instead of the pocket-sized fictions that elaborated on the Guide’s illustrations, these paintings are accompanied only by their titles. Some of the titles, however, nearly amount to microfiction in their own right; a phrase like “It Took Me Until Halfway Through To Realize My Life Story Has An Unreliable Narrator” forces the reader to re-evaluate a head-and-shoulders image of a Rosy-faced Lovebird against a pearly gray background by confronting the total unknowability of the bird’s mind — and the persistent human desire to know that mind anyway. If this sounds a bit too elevated for a bird, rest assured that many of these paintings and captions are commentaries on issues very relevant to the subjects themselves. My personal favorite, for obvious reasons, is the glowing, almost haughty female Red-necked Phalarope captioned “‘Just For A Laugh’ Is Rarely An Excuse For The Coordinated And Sustained Introduction Of Non-Native Species”. But enough about words. This is an art book, and the paintings deserve a bit more analysis here. As The Mincing Mockingbird, Adrian has a distinctive, instantly recognizable idiom: birds (or occasionally eggs) portrayed singly or in small groups, often off-center and partially out of the frame, against stark monochromatic backgrounds. Occasional flourishes like an ornate frame or a prey item add interest, but even the plainest portrayals are striking. The birds are real species, portrayed with enough detail to make them readily identifiable, but the images are subtly different than what you will see in a field guide or typical book of wildlife art. As I mentioned before, these are portraits, and Adrian’s use of portrait techniques — particularly the ways that the birds confront or evade the viewer with their gazes — gives a very real sense of the birds as characters without ever sliding into cute or cheap anthropomorphism. In short, this book represents Adrian continuing to work his chosen territory very fruitfully, and I’m curious to see what the future will bring for this artist. You Can’t Have Too Much Fun!